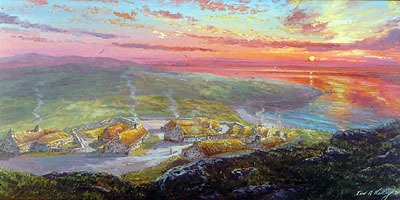 This tranquil scene shows the restored village of blackhouses at the crofting village of Carloway on the West side of Lewis. The sky is spectacular in golden strong colour. The sea is flat calm. The peat smoke emanates from the chimneys as those within relax.